Pie will always have my heart. 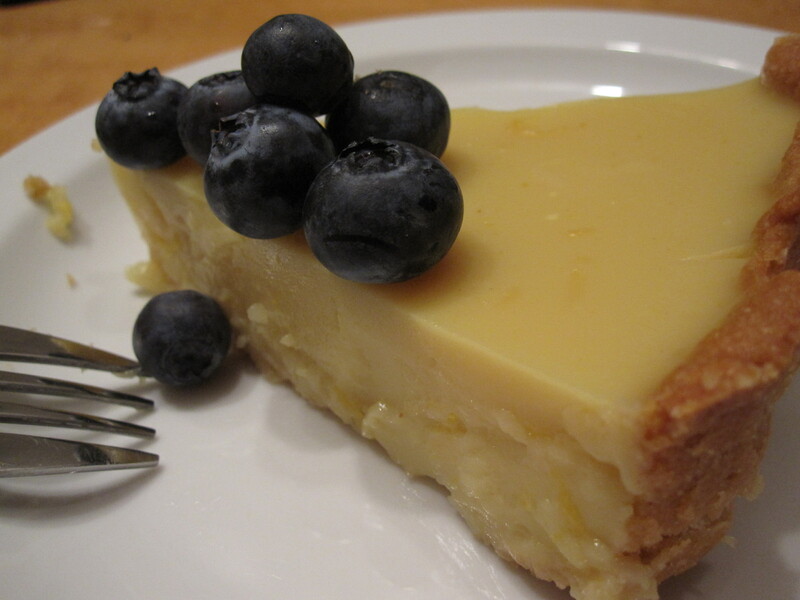 But I have to admit, there’s something sweetly tempting about a delicately balanced tart. It brings many of the same satisfactions of a pie without the bloated feeling that so often occurs just after indulging in a hearty slice (or three). Although I’ve never really felt a strong affinity toward tarts, I have definitely come to appreciate their charms. And after making this little beauty I must say I’m looking forward to making many more (it helps that I just became the proud owner of this stunning red tart dish). The first tart I made was the product of a failed attempt at banana cream pie. I had to pre-bake the crust since it doesn’t need to bake once the filling is poured in: I diligently prepared my all-butter crust, rolled it out, lined my pie dish with the dough, crimped the edges to make them presentable, poked the bottom with a fork so it wouldn’t bubble, and placed it in the oven. When I pulled it out I was devastated to discover that the edges of the crust had slid down the sides and retreated into the dish, making for a very shallow basin that simply would not do to hold the banana cream filling. Aw shucks. It seemed to me that I had gotten a little too cocky and now my successful run as a pie baker had come to a heartbreaking end. Somewhere in between feeling like a total letdown and contemplating simply forking the baked crust and eating it right then and there, I somehow had the epiphany to turn my pie frown upside down and MAKE A TART. Brilliant! One woman’s failed pie crust was the crust for another woman’s (or in this case, the same woman’s) tart. It was the middle of summer so strawberries and lemons were everywhere, and the farmer’s market was the next day. Thus did I manage to salvage my pride. To my delight I discovered that making tarts is really easy! Win! After my smashing summer tart hit, I was skeptical about making one of the vegan variety. But seeing as I’m not currently consuming animal products and I didn’t feel like slaving for hours over a tart and then not being able to enjoy the fruits of my labor, I figured I had nothing to lose in at least giving vegan tart a fair try. So very glad I did. This tart is a gem, and if you’re as lucky as I am to have a wonderful roomie/friend who will buy a Le Creuset tart dish for you as a Secret Santa gift (or even if you’re not), then do yourself a favor and go make this tart. Like now. Preheat the oven to 350F. Lightly grease a 9 inch tart pan. Melt the butter (takes about 23 seconds in the microwave). Mix it in a medium-sized bowl with the maple syrup. Allow the mixture to cool slightly, then add the almond meal, flour, and salt. Stir well to combine. It will become thick like dough pretty quickly. Press the dough into the tart pan with moistened fingertips. Use your thumbs to press it into the fluted sides of the pan. There will be just enough dough to completely fill the pan. Prick the dough several times with a fork. Bake for 20 minutes, or until golden brown. Transfer the tart shell to a rack to cool. Turn the oven off. To make the filling, in a saucepan over medium heat, combine the coconut milk, 1 cup of the water, sugar, agar, and turmeric and simmer until the agar dissolves. Stir in the lemon juice, lemon zest, and vanilla. Raise the heat and bring to a boil. Dissolve the arrowroot in 1/2 cup water, then stir into the saucepan and cook for 1 minute, or until the mixture thickens. Remove the pan from the heat and whisk in the yogurt until the mixture is creamy smooth. Pour the filling into the tart shell and cool at room temperature before refrigerating until firm and chilled, about 1 to 2 hours. Sprinkle the berries on top before serving. 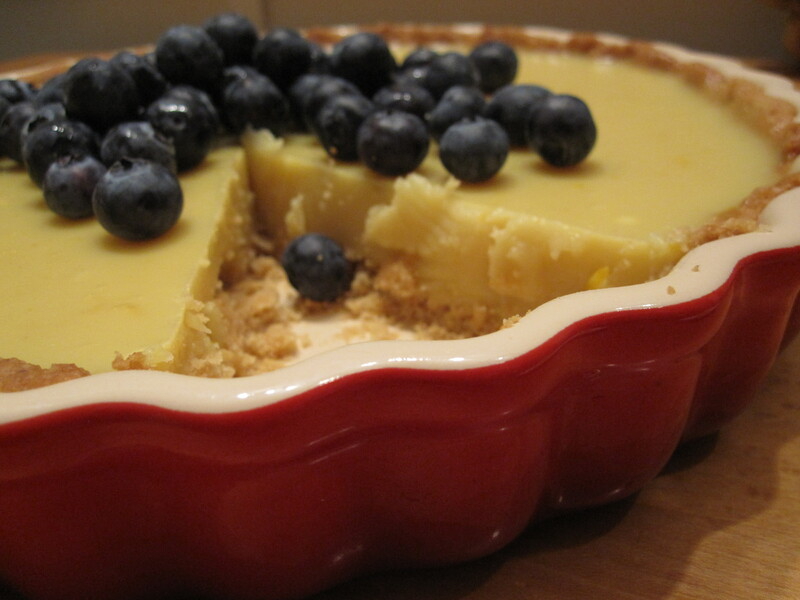 This entry was posted in Not pie, Vegan and tagged almond crust, blueberries, lemon, tart, vegan. Bookmark the permalink. 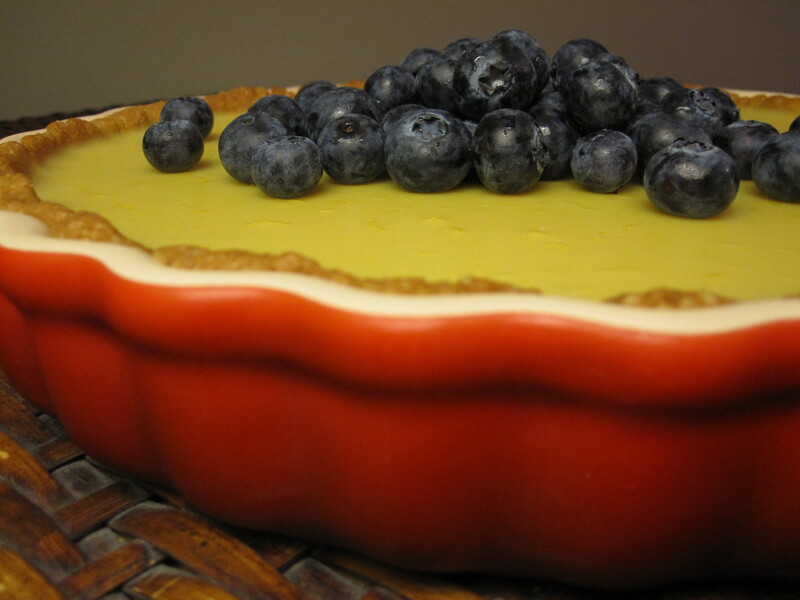 This tart looks absolutely exquisite! I count myself as part of Team Pie, but like you, I always appreciate a good tart. I’ll definitely make a note of this recipe. I’m always on the lookout for tasty treats to bring along to potlucks and gatherings.